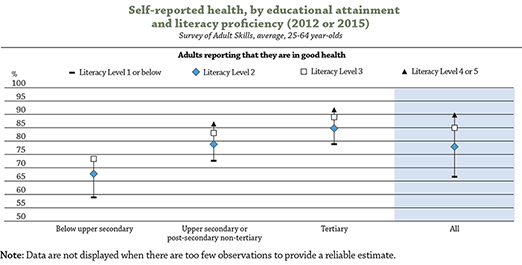 Education and skills foster health and well-being, but why is this a problem? Knowing, for example, that tobacco is bad for one’s health influences smoking behaviour much less than being able to control one’s own lifestyle. Schooling, together with non-formal and informal learning experiences, has been found to foster the acquisition of skills that matter for health behaviour. It is one of the great insights of recent educational research that education is a very important driver of social progress, and that this happens through the transfer of knowledge and the development of cognition, but probably even more so through fostering the social and emotional skills that allow people to control and change their behaviours. The latest results from PISA are released today. Before you look to see how well your country performed on the triennial test of 15-year-olds students around the world, consider this: only 20 short years ago, there was no such thing as a blog. If it weren’t for science and technology, not only would you not be reading this right now, but there wouldn’t be the device on which you’re reading it – or countless other gadgets, medicines, fibres, tools… that have become all but indispensable in our lives. Obviously, we don’t all have to be scientists to live in the 21st century. But an understanding of some basic principles of science – like the importance of experiments in building a body of scientific knowledge – is essential if we want to make informed decisions about the most pressing issues of our time (or even if we just want to choose the “healthiest” option for lunch). PISA (the Programme for International Student Assessment) was introduced in 2000 and held every three years since. The test is of skills, not knowledge: what you can do with what you know is what counts. But over time the emphasis has shifted. The focus today is whether students can think like a scientist, reason like a mathematician and distinguish between good and bad arguments in a written text. We live in an era of unimaginable technology breakthroughs, conflicting values and threatened political norms. Literacy, in all three of the foundational domains, is the key to making sense of the world and shaping it for the better - for everyone, not just elites. Last night I got a taxi home and as often happens, the driver and I got chatting. Then he asked me a rather strange question – “Do you like the smell in my car?” Well, I have to say the smell was a very subtle one but it led to a fascinating conversation. With some pride, he told me that he was trying out a new product for cleaning car interiors developed by a friend of his. His friend already had his own business selling these products and then came the big surprise – this friend is only 17 years old. But isn’t he still in school? I asked. Yes of course, he was doing a professional baccalaureate (a vocational programme here in France).